CAROLINA SOUL :: Soul Recordings from the Carolinas » Can Greensboro Get an Amen? Can Greensboro Get an Amen? 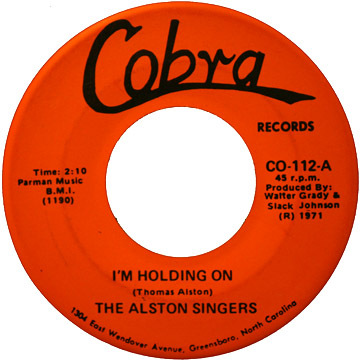 In a continued effort to give Greensboro some praise, we are posting this gospel offering from the Alston Singers, released in 1971 on Walter Grady’s Cobra label. With their uptempo testimony “I’m Holding On” clocking in at just over two minutes, this group from nearby Burlington would go on to curse Grady’s name in unison with many of their secular labelmates. No confirmations as to whether the Lord’s name was taken in vain. From the 1973 Greensboro phone book, an ad for George Bishop’s record shop, Mr. Entertainer, which he ran for four years starting in 1972. Busy man. What it looks like in recent times. 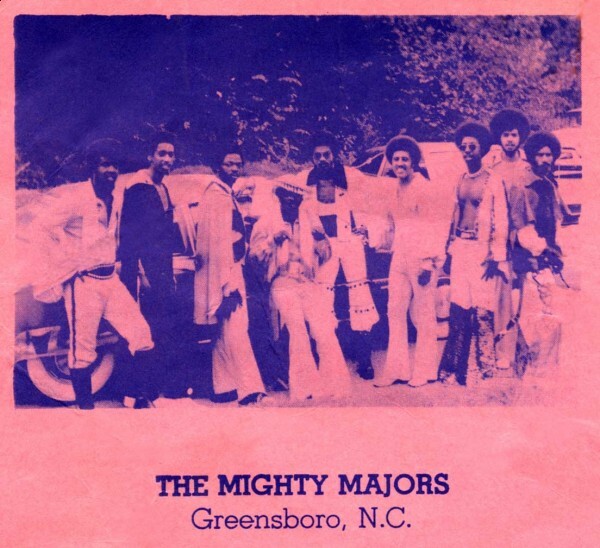 Greensboro, North Carolina’s long-lived Mighty Majors band ranks as one of the state’s best-remembered R&B outfits of all time, and we’re happy to tell of their origins with assistance from their founder, leader, bass guitar player, and sometimes producer George D. Bishop, III. Bishop is a native of Asheville, North Carolina who excelled at sports and served as student body president at the mountain town’s last African-American high school, Steven Lee. Outside of school, Bishop held down the bass in the Original Tams Orchestra of Brevard, North Carolina, who played behind the likes of Bo Diddley, Curtis Mayfield, and Gladys Knight. Upon his arrival on a music scholarship at North Carolina A&T in Greensboro in 1964, the eager teenager was asked to provide the backing at his class’s freshman talent show, for which he brought together fellow music majors. Their performance a success, and with encouragement to continue gigging, Bishop went for an obvious choice in name—the Majors—and began offering their services to national touring acts—their ability to read music meant they could learn the hits quickly—and Bishop also transcribed tunes for local producers and songwriters who needed to prepare lead sheets for copyright registration, including a young Walter Grady. Bishop graduated from A&T in 1968, but the band continued to play on high-profile gigs, and on one in Shelby, North Carolina that year, local promoter Ray Caviness dubbed them the “Mighty Majors”, and the lengthened handle stuck around. Below we’ve got audio, images, and commentary on all their recordings as the (Mighty) Majors and the Third Membrane, plus one as the Party Brothers. The latter, from their days backing up Jamo Thomas, might be their first, and it’s a funky nod to the college where their story began. In the early 1970s, Bishop founded his own Gate City label. Possibly the only release, this Crescent-City Sound Studio-recorded rarity showcases the Majors at their funkiest. Note the hand-stamped artist name; I have another copy that doesn’t have it! Around the same time as the Gate City effort, Bishop calculated that a shift in style might help reach new markets. Crafting what he looks back on as “a gay, uptempo, happy sound” in the form of “My Little Heart Starts Thumpin”—certainly influenced by famous pop/rock act Chicago—and pairing it with a strange, randomly-concocted name “Third Membrane”, Bishop co-produced with Jimmy Cheek the first of several releases by different artists for the local imprint House of Big Brother. 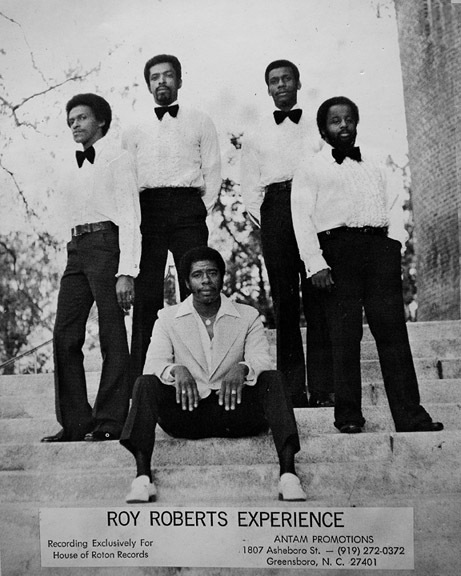 We are aware of only one other ‘70s-era 45 on the label, by the Roy Roberts Experience. Check the drum break at about 1:38. The aforementioned Kevan Tynes provides the falsetto on this lovely mid-‘70s track cut at Harry Deal’s Galaxie III Studios in Taylorsville, North Carolina (an earlier version was made at Bishop’s own Reel Time Studio, but it is unclear whether it was ever pressed) and released by Homer David Smith, owner of the Bandit label in Asheville. Richard Butler, later of Gaston, the flagship act of the Chocolate Cholly’s label, alternates with his gorgeous tenor. Many consider the result to be the Majors’ finest hour. Bishop does not recall ever giving authorization to Walter Grady to release “At The End Of The Tunnel”, but we’re glad it’s here on the B-side of this obscure disc. The “hit” side contains a drinking song entitled “Boom Boom Chug-A-Lug”. The group shows their rap styles circa 1984. I think I hear Bishop on one of the verses.